I am a curious eater. When I´m eating out, I´ll probably order something I don´t know just to find out if it´s good. When I come home from the market, I´ll proudly present my latest discoveries. I´m taste hunting. The idea to miss any deliciousness due to sheer ignorance drives me crazy. Last week at the fishmonger´s, I had already chosen three pounds of beautiful moules Bretons. These mussels come from the coast of Northern France, and they are extra tasty, smaller than the ones I knew, and with a delicious orange meat shimmering inside a craw colored shell. So far, so very good and well-known in countless variations. Then I heard myself say: “I´d like a few of les bulots (marine snails) as well, Monsieur!” We hadn´t had bulots before, and we´re actually not very enthusiastic when it comes to snails (at least the terrestrial species we know). But that morning I just fell for their rough swirly shells. Plus they were ready to eat, so if not try now, when then ? I went home with my catch, feeling both a bit guilty and exited. Facing that little snail challenge I was obviously up to, I was even happier to have the mussels up my sleeve. They were my safe harbor, one of our favorite meals and always a hit. Not only very delicious, but fun to eat – you can use an empty shell as a fork to pick the mussels, and even better squeeze each other´s noses with them. Needless to say my son loves that! To make up for the supposedly unwelcome snails, I paired them with as much favorites as possible: jambon des Pyrenées (ham), champignons roses and sausage meat (because these pork sausages are one of my latest food crushs) – goodies from land & sea all united in one large steaming pot! As of the bulots: I served them as a starter with a succulent tomato sauce made of the most amazing coeur de boeuf tomatoes that are sold on every corner here. Sprinkled with parsley and crispy garlic chips, I couldn´t think of a better way to make these snails look appetizing and less like…well, snails. But in the end, that´s what they were, though much tastier than expected. I can´t say I have discovered a treasure of the sea, but what was I expecting: not all seafood is created equal, and a snail is not a lobster. Who´s to blame for that? Clean mussels under cold running water. Discard the broken ones. In a large pot, fry onion in butter until translucent (1-2 min), add slices of ham, a dash of pepper, garlic and sausage meat and continue to fry. Press meat with the back of a fork so you obtain „sausage crumbles“. After 2-3 minutes, add mushrooms and fry for another 3 minutes, perhaps adding a tbsp more butter. Deglaze with white wine (1 glass or more), stir, add mussels immediately, close lid for 5 minutes and steam at high heat, until the mussels are open. Finally, ou can add some cream to the sauce if you with. Sprinkle with parsley, serve with baguette and/or French fries. And don´t eat any mussels that are broken or do not open „voluntarily“. I usually make larger batches of the tomato sauce and store it. For this dish, I reheated the snails in about 1/3 of the above quantity of sauce. After 45-60 minutes, reduce heat to low and allow to simmer uncovered for a while, until desired consistency is reached– 30 minutes minimum, better 1 hour or so. Remove bay leaves, adjust seasoning. Heat snails (cleaned under running cold water) in the tomato sauce. Meanwhile fry garlic chips in a small pan (in olive oil). Sprinkle with garlic and chopped parsley. Serve with baguette. Miesmuscheln gehören für mich zum Leckersten, was das Meer zu bieten hat. Die hiesigen, die von der nordfranzösischen Küste (also quasi ums Eck) kommen, sind etwas kleiner als die, die ich bislang kannte, und intensiver in Geschmack und Farbe. Schimmert ein mattes Orange zwischen den krähenblauen Schalenhälften hervor, wenn der Fischhändler eine Muschel öffnet, kann man sich auf ein köstliches Gelage freuen, das mit Bergen leerer Schalen endet. Ein solches schwebte mir vor, als ich vor einigen Tagen gut drei Pfund moules auf dem Markt erstand. Dazu kaufte ich zu meiner eigenen Überraschung etwas anderes. „Monsieur, je voudrais bien quelques bulots!“ hörte ich mich auf einmal sagen. Wie bitte, Meeresschnecken? Ich mag eigentlich keine Schnecken, aber der Satz kam wohl aus meinem Mund. Manchmal siegt eben die Neugier. Mit einer Mischung aus Anglerstolz und schlechtem Gewissen brachte ich meinen Fang nach Hause. Es war klar, daß ein Schneckengericht nicht auf Begeisterung stoßen würde, umso waren die moules mein As im Ärmel. Miesmuscheln sind bei uns immer ein Hit, allein schon deshalb, weil man eine leere Schale als Gabel benutzen und sich am Ende gegenseitig in die Nase zwicken darf. Mit Bayonner Schinken, Wurstbrät, Champignons und Petersilie kombiniert, finden sich bei diesem Essen so einige Lieblingszutaten von Land und See zusammen – der Versuch einer Wiedergutmachung, zum Ausgleich für die wenig geschätzten bulots. Strategiegemäß bekamen diese Gesellschaft von Tomaten, Knoblauch und noch mehr Petersilie, damit sie ein bißchen weniger wie… Schnecken aussahen. Doch am Ende waren sie das nun mal, wenn sie auch viel besser schmeckten als erwartet. Sie sind sicher nicht gerade die größten Schätze unter des Meeresfrüchten, aber dafür können sie nichts. Es kann schließlich nicht jede kleine Schnecke ein Hummer sein. Miesmuscheln mit fast allem (Pilzen, Bayonner Schinken und Wurst) 1,5 kg Miesmuscheln 4 Scheiben Bayonner Schinken (oder Parma-/Serranoschinken), in Streifen geschnitten 150 g grober Schweinsbratwurst ohne die Pelle 6-8 braune Champignons , geviertelt 1 gewürfelte Zwiebel 2-3 klein gehackte Knoblauchzehen 1 Glas Weißwein Pfeffer 1-2 EL Butter Sahne, optional Große Handvoll gehackte glatte Petersilie Muscheln unter fließendem kalten Wasser säubern und die beschädigten entfernen. In einem großen Topf Zwiebel in Butter glasig anschwitzen, Schinken, etwas Pfeffer, Knoblauch und Wurstbrät zugeben und ein paar Minuten braten. Dabei das Brät mit dem Rücken einer Gabel „zerkrümeln“. Dann Pilze zugeben und weitere 3 Minuten braten, evtl. etwas Butter zufügen. Mit Wein ablöschen (1 Glas oder mehr) , sofort Muscheln dazu und bei geschlossesem Deckel ca. 5 Minuten bei starker Hitze dünsten, bis alle Muscheln geöffnet und damit gar sind. Wer möchte, kann zum Schluß 120 ml Sahne zugeben und die Muscheln dann mit Baguette und/oder Pommes frites servieren (und natürlich keine Muschel essen, die sich nicht von selbst öffnet oder eine beschädigte Schale hat). Die Tomatensauce mache ich meistens im voraus und in größeren Mengen. Für die Schnecken reichen etwa 1/3 der Rezeptmenge. In einem gußeisernen Topf 2-3 EL olivenöl erhitzen und geviertelte Tomaten ohne Strunk, Lorbeerblätter, Salz, Zucker und Pfeffer hinzufügen. Bei mittlerer Hitze etwa 45 min kochen und dann die abgelösten Schalen mit einer Gabel herausfischen. Dann Hitze reduzieren und weiter einkochen lassen, den Deckel dazu abnehmen (30 min, besser etwa 1 Stunde). Lorbeerblätter herausnehmen, abschmecken. Schnecken unter kaltem Wasser abspülen und in der Soße erwärmen. Zugleich Knoblauchscheibchen in Olivenöl knusprig braten. Knoblauchchips und gehackte Petersilie zum Schluß über die Schecken streuen und servieren. Your images are beautiful and beautifully styled. Wish we could get sea snails locally, but no chance. Our mussels are a lot bigger but just as enjoyable. I’ve had those little ones in Nice; loved them. In New Zealand they have giant green ones; I think they’re inferior to the black ones. I love sea snails!!! What a wonderful mussels dish! I’m so envious! Just lovely! I have only had sea snails a few times in Italy and have not acquired a taste for them yet. The first time they were served cold and it was a challenge to eat them, I confess. Your post is delightful and has given me the urge to get to Europe, as here in the Emerald city these delights are difficult to locate. Thank you so much for these lovely words. I´m really glad you enjoyed the read and yes, we seem to agree that sea snails are a bit challenging to enjoy.If you do get to Europe and maybe Paris, please let me know: We´ll perhaps have a snail meal together ! Oh, I shall! We are planning a Spring trip……what delights! i must tell you how incredibly envious i am that you have local snails! the last time i had snails was in vietnam. they’re available at asian markets but i am not certain of their methods of catching/harvesting the snails. anyway, my favorite preparation is steamed simply and dipped into a sweet/salty/spicy lemongrass sauce. your preparation looks divine! That sounds completely amazing! I´ll remember this sauce when I´ll make snails next time! Your mussel dish looks delightful . I never had sea snails , I should try them. Next week I will be in Paris and look for sea snails in the markets. Good girl—and a big gold star to you for being adventurous! The shells are lovely, but I can’t really make myself love the bulots. Steve, of course, being the more adventurous eater, orders them every time he gets the chance when we’re in France. 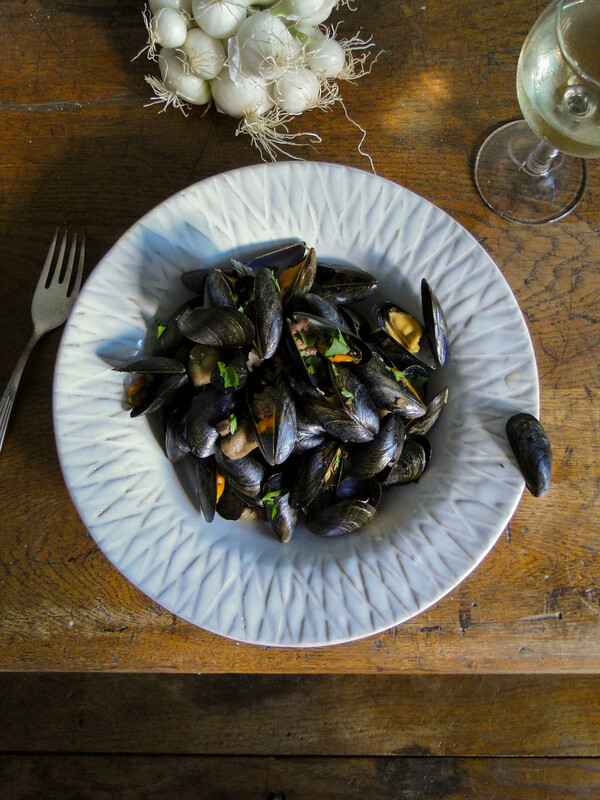 I do love the tiny French mussels, though, and yours look delicious. I think you deserve a medal for simply buying them! Not sure I would have had that kind of courage! 😉 Love, love the photographs. The colors are so beautiful and vibrant! The more sceptic one is about the food, the more appetizing it should look, right, can´t hurt! Ta recette est divine ! Mon marie fait la même chose que toi ! Il adore reproduire les recettes de restaurants. Moi aussi, mais j’arrive moins bien que lui. Ici, dans le Bassin d’Arcachon, on mange beaucoup des bulots. Normalement les vendent déjà assaisonner et on le mange avec une délicieuse mayo. Je te souhaite une belle weekend Sabine ! Bonne dimanche à toi aussi!! I applaud your adventurous desire to try new foods and your beautiful photos would entice many to try your meal. That´s sweet of you, Karen, to put it that way! You might also say, it´s the definition of gluttony: trying anything out of pure fear to miss a treat! Glad we seem to be kindred spirits when it comes to culinary curiosity! The mussel recipe is quite common around here, I guess. I would´t have tried if it wasn´t a trustworthy soul telling me how well the flavors/meat/seafood work. And so true!Worth a try !